IITA in partnership with the Institute of Agricultural Science of Burundi (ISABU) and Rwanda Agriculture Board (RAB) have launched a new project titled “Fighting Cassava Brown Streak Disease (CBSD) and Cassava Mosaic Disease (CMD) through the deployment of new resistant germplasm and clean seed in Rwanda and Burundi”. The two diseases are a major threat to cassava production in the two countries and neighboring eastern DR Congo. Of concern is CBSD which was first reported in the region in 2009 and is spreading rapidly. The four-year project seeks to increase cassava productivity in the countries through the development and deployment of CBSD/CMD resistant varieties, as well as establishing a system to produce and disseminate to farmers high quality virus-tested seed. It is funded by IFAD and led by IITA with the national cassava research programs at ISABU and RAB, from Burundi and Rwanda, respectively as the major partners. 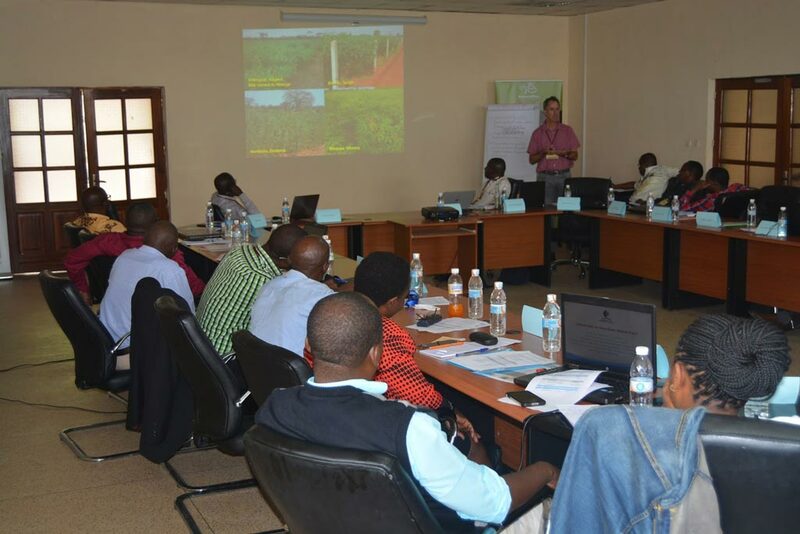 The launch workshop brought together stakeholders from the two countries and was held at the IITA-Kalambo station in Bukavu on 15–18 May. Chris Okafor, officer in charge of IITA-Kalambo station, representing Bernard Vanlauwe, regional hub director, officiated the launch. Speaking at the workshop, Silver Tumwegamire, the project leader, said the expected outcomes of the project in the two countries included a 50% increase in cassava productivity for 20,000 cassava farmers through the introduction of high-yielding and disease-resistant varieties, and establishing a sustainable system for dissemination of certified early generation seed (prebasic and basic) of the best varieties. The project builds on the experiences and lessons from the just concluded New Cassava Varieties and Clean Seeds to combat CMD and CBSD project (5CP in short) implemented in five countries in East and Southern Africa. It will make use of the new improved cassava varieties selected under the 5CP project that showed high levels of tolerance for the two viral diseases. The meeting also brought participants from other IITA-led projects including the 5CP and Action to Control Cassava Brown Streak Disease in DR Congo (CBSD-DRC) to share their experiences and lessons learned, and to identify areas of synergies. The CBSD-DRC is led by Nzola Mahungu who is also the country representative for DR Congo. 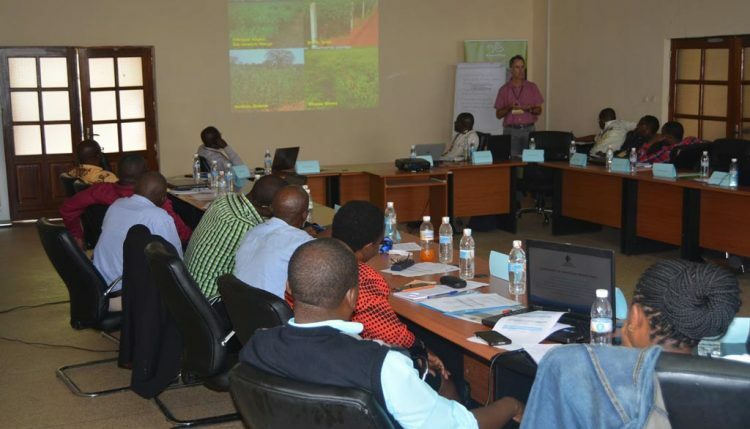 James Legg, IITA Virologist, shared experiences and lessons on the development of a pilot clean seed system for cassava in Tanzania under 5CP. He also outlined the requirements and approaches of developing clean seed systems to produce virus-tested cassava prebasic seed. Regina Kapinga, Head of Advocacy and Resource Mobilization at IITA gave a presentation on the importance of ensuring that the project was aligned and mainstreamed to the priorities of the two countries for greater efficiency, effectiveness, and impact. “We need to ensure our activities are relevant to the countries where we work. We also need to systematically track the progress we are making in contributing towards the countries’ economic growth through agriculture,” Kapinga said. Mahungu’s project in DR Congo also aims to maintain sustainable cassava productivity through the development and promotion of appropriate varieties resistant to CBSD and other biotic constraints, and to disseminate approaches for the integrated management of cassava diseases and pests to contribute to increased food availability, income generation and sustainable livelihoods. In addition, he presented the one-year work plan activities. The workshop concluded with a visit to the virology laboratory at IITA-Kalambo where researcher Clerisse Casinga talked about a CBSD study conducted in DR Congo under the supervision of IITA’s Legg and Rudolph Shirima in 2016.